February 6 – 10, 2018 – Hyatt Regency Hotel and Conference Center, ABQ, New Mexico, USA. February 14 – 18, 2017 – Hyatt Regency Hotel and Conference Center, ABQ, New Mexico, USA. February 9 – 13, 2016 – Hyatt Regency Hotel and Conference Center, ABQ, New Mexico, USA. February 11 – 14, 2015 – Hyatt Regency Hotel and Conference Center, ABQ, New Mexico, USA. Our annual conference held February 19 -22, 2014 established a milestone for the organization as we began our 35th year honoring the legacies of Peter C. Rollins and Michael Schoenecke our founders and mentors. 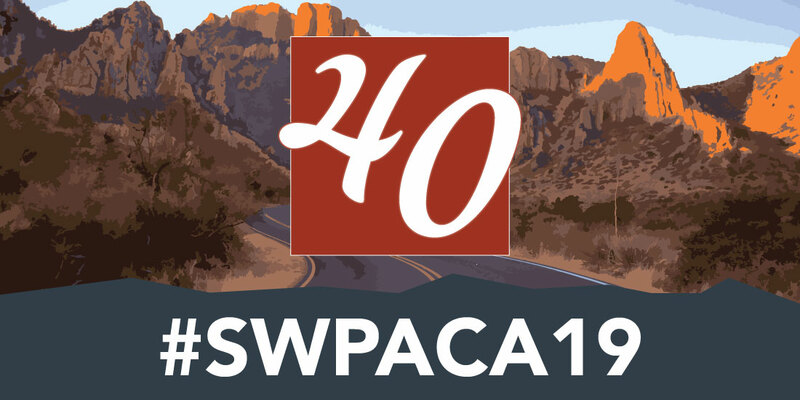 This years event introduced everyone to our new name the Southwest Popular American Culture Association (SWPCACA) and our Executive Director, Lynnea Chapman King, who as it was noted will be the only individual to have served as executive director of both organizations. Highlights of this years event include a special keynote presentation by Dr. Spencer Hererra, Levi Romero, and Robert Kaiser discussing their book Sagrado: A Photopoetics Across the Chicano Homeland (UNM Press, 2013); the expansion of our graduate student professional development series; our academy award ceremony known as the Peter C. Rollins Book Award / Graduate Student Award Ceremony where 300 people enjoyed our Rollins Book Award keynote speaker Alissa Perren discuss her most recent book Indie, Inc.: Miramax and the Transformation of Hollywood in the 1990’s (UT Press, 2012); including the awarding of our first undergraduate Heldrich-Dvorak Travel Fellowship. The SWTX PCA/ACA’s annual meeting introduced our new Executive Director, Lynnea Chapman King, PhD., Kelli Shapiro, PhD as SWTX Area Development & Awards Coordinator, Tamy Burnett, PhD., Public Relations Coordinator and Chris Trujillo, SWTX Media Consultant. A fond farewell was made to Sally Sanchez, SWTX Program Coordinator, who started with Phil and Ken in 2003 having decided to “retire” from the organization at the end of the 2012 conference. All who knew Sally remember her quick smile, dedication to the organization, and the many, many weekends including Christmas and New Year’s creating our annual conference program. Special thanks go to our featured speakers, Jane Espenson and Brad Bell, co-creators of the comic web-series about marriage equality, Husbands (Husbandstheseries.com); David Peterson (2nd Appearance! ), creator of the Dothraki and High Valyarian languages for HBO’s Game of Thrones, language and culture consultant for SyFy’s Defiance, and president of the Language Creation Society (www.conlang.org); and Dr. Øyvind Vågnes (University of Bergen, Norway), whose book Zaprudered: The Kennedy Assassination Film in Visual Culture (Univ. of Texas Press, 2011) received the 2012 Peter C. Rollins Book Award. Working with the Hyatt Regency Hotel and Conference Center plans were made to honor Phil’s legacy to the SWTX PCA/ACA. Once again our partnership with the Hyatt was on full display during the conference they brought to ABQ Peter C. Rollins the founder of the organization, Michael Schoenecke, past officer of the organization, John Bratzel, Executive Director of the National PCA/ACA; and of special importance Phil’s family including his brothers, wives, and most important Phil’s wife and daughter. A special formal luncheon (SRO) was planned recognizing Phil and Susan Rollins who had also died from complications with in the summer of 2011. Ken Dvorak served as master of ceremonies aided by Michael Schoenecke who spoke eloquently about the legacy of Susan Rollins and with the help of Phil’s family memories were shared honoring Phil’s accomplishments as a father, scholar, mentor, and friend to all who encountered his ready smile, quick wit, and his penchant for burritos. This joint meeting of the National Popular/American Culture Association and Southwest Texas PCA/ACA was billed as the “World’s Largest Gathering of Popular/American Culture Scholars.” Over 3500 people crowded into San Antonio enjoying great weather; the River Walk; Texas/Mexican eateries; and most important a wonderful conference. Unfortunately, our friend and colleague Phil Heldrich, passed away due to complications with cancer on November 11, 2010. He leaves a rich and honored legacy with the SWTX PCA/ACA, having witnessed the organization grow in numbers, influence, and recognition as THE Popular/American Culture conference to attend. We paid homage to Phil during the joint PCA/ACA – SWTX – PCA/ACA conference in San Antonio in 2011. However, our “adopted” home and part of Phil’s heart has always been in Albuquerque, so our Area Chairs decided to honor him with a gala celebration honoring his leadership of the SWTX PCA/ACA in 2012. The annual meeting of the Southwest Texas Popular/American Culture Association took place in the high desert city of Albuquerque, New Mexico. This year we had representation from over 20 foreign countries including individuals from Kuwait, Israel, Portugal, India, China, and the United States who experienced the charm and beauty of New Mexico. The conference was dedicated to Dr. Ray Browne (1922-2009) the founder of the National PCA/ACA, its regional organizations, and the inspiration behind the Journal of Popular Culture and the Journal of American Culture. A prolific author and advocate for Popular/American Culture scholars, Ray’s influence was felt worldwide. Highlights for this meeting included packed presentation rooms from the opening night’s Fire & Ice social event to the concluding panels on Saturday afternoon. Our graduate student award recognition ceremony was hosted by keynote speaker Adilifu Nama, the 2009 Peter C. Rollins Book Award recipient who spoke about the importance of public intellectuals in American life. The conference concluded with our first “excursion” to Santa Fe hosted by Executive Director, Phil Heldrich, expertly guiding over 65 individuals through the maze of New Mexico Rail Runner train travel to Santa Fe spiriting them around the city in a highly animated walking tour of the cities historic/cultural attractions. Our anniversary theme Reeling in the Years: 30 Years of Film, TV and Popular Culture (1979 – 2009) served as the backdrop for our annual conference held at the Hyatt Regency Hotel and Conference Center. Amid concerns that the national economy and lack of institutional support would play a decisive role in attendance, Phil and Ken, nevertheless were excited to welcome over 900 presenters for this gala event. Our four-day event was highlighted by several changes including our first “English High Tea” that featured as guest speaker former New Mexico governor David Cargo. Celebrating the scholarly contributions of our graduate students a special ceremony hosted by Dr. Katie Mills, the 2008 Peter C. Rollins Book Award winner, discussed at length her research in writing The Road Story and the Rebel: Moving Through Film, Fiction, and Television (Southern Illinois UP, 2006). The conference featured an excellent mix of panels including special screenings of Rock n’ Roll High School (1979); Traces of the Trade: A Story from the Deep North (2008) hosted by James DeWolf Perry; the film Cannibal Holocaust (1979) and Roundtable; and our famous late night sing a-longs. The 30th anniversary conference ended on a solid note with many individuals providing us valuable feedback with our first pre/post conference survey. The annual meeting of the Southwest Texas Popular/American Culture Association took place in Albuquerque, New Mexico hosted by the Hyatt Regency Hotel and Convention Center. The Hyatt Regency rolled out the red carpet for our presenters and guests providing excellent accommodations with an attentive staff and professional AV support. This year the SW/TX partnered with the Hyatt in our first ”Go Green“ initiative featuring recycling bins, hallway beverage containers instead of the standard pitchers of water in each presentation room, and a reduction of the number of paper products found on the beverage and snack stations. The Land of Enchantment continues to draw individuals from the United States, Europe, the Middle East, Africa, South America, the Pacific Rim, and Canada. This year the organization set a record for opening day registrations (600) and for total attendance (1200). The annual ”Fire and Ice“ opening night social/mixer set the tone for the conference and for four days people were reported to be engaged in deep conversations, attending standing room only presentations and generally having a good time! Our keynote speaker, singer/writer/poet/performance artist, Joy Harjo, and Grammy award guitarist, Larry Mitchell, captivated an audience of 500 for over ninety minutes mixing music and poetry to the quiet attendees. The land of enchantment continued to work its charm with the SW/TX PCA/ACA when the organization met for the 28th consecutive year as wintry conditions throughout the country delayed arrivals for many of our presenters and guests. By Thursday noon a steady stream of tired, travel-weary presenters descended on the conference hotel, swelling our numbers to over 900 at the conclusion of the conference. Highlights for 2007 include the first ever ”Fire and Ice“ opening night reception hosted by the Hyatt Regency Hotel, featuring a “meet and greet“ that lasted for over two hours, WiFi access throughout the conference presentation area, the inclusion of LCD projectors, DVD/VCR player combos, wide-screen projection screens, and speakers for each presentation room. Professional registration personnel who made checking into the conference quick and friendly, and a special evening for our graduate student award winners hosted in the atrium of the Hyatt Regency complete with light refreshments, music, food, and good cheer. Our keynote luncheon featured the legendary, John Perry Barlow, of Grateful Dead fame, who in a relaxed ”Q & A“ session provided the packed Grand Ballroom with his wisdom, life experiences, and unique humor. This year’s event was the largest ever in organizational history as Phil and Ken welcomed 1200 participants, many of whom praised the SW/TX staff for organizing such an outstanding event. The 2006 keynote speaker was Dr. Winston Wheeler Dixon, the James P. Ryan Endowed Professor of Film Studies at the University of Nebraska. Dr. Dixon’s work Lost in the Fifties: Recovering Phantom Hollywood was the recipient of the 2005 Peter C. Rollins Annual Book Award of the SW/TX PCA/ACA and was the subject of his presentation. During the keynote ceremony, nine graduate students were honored with various awards for their conference presentations. Additional highlights from the conference included a journal roundtable sessions titled ”Breaking into Print, or what do Editors Really Want or Need?“ The session was chaired by Jim Welsh, Founding Editor, Literature/Film Quarterly. Panelists included Co-Editors Gwendolyn Audrey Foster and Wheeler Winston Dixon, Quarterly Review of Film and Video, Gary Hoppenstand, Editor, The Journal of Popular Culture, Gerald Duchovnay, Founding Editor, Post Script, Kathy Merlock-Jackson, Editor, The Journal of American Culture, Deborah Carmichael and James Knecht, Associate Editors, Film & History, Peter C. Rollins, Editor-in-Chief, Film & History, and Richard Vela, Contributing Editor, Literature/Film Quarterly. At the annual area chair/business meeting, Phil and Ken noted the six new areas for 2006 and the success their area chairs had in bringing many new individuals to our meeting. The area chairs also recommended that Albuquerque become the ”adopted“ home of the SW/TX organization—a vote that met with resounding approval. The 26th annual SW/TX meeting was the first to be held in downtown Albuquerque, and it was an exceptional gathering. The beautiful Hyatt Regency Hotel served as host, and Phil and Ken greeted over 900 participants. Our Program Coordinator, Sally Sanchez, handled her duties, expertly managing the Reservation Desk with the able assistance of Tilly Garcia-Slaten, and Lacy Landrum (SW/TX web designer). Conference highlights included film screenings of Strange Fruit (2002) and a plenary session discussing the film Guess Whose Coming to Dinner (1967). The keynote speaker, Krista Elrick, captivated the audience with her presentation titled ”Enchanting Light: Historic and Contemporary Photography in New Mexico.“ The Chronicle of Higher Ed’s ”Ms. Mentor“ (Emily Toth) paid a visit, regaling her fans with stories from ”When Academics Get Angry: Nasty Letters to Ms. Mentor.“ The conference also featured a journal editors’ roundtable hosted by Gary Hoppenstead, Editor, The Journal of Popular Culture, Wheeler Winston Dixon, Editor, The Quarterly Review of Film and Video, Gerald Duchovnay, Founding Editor, Post Script, Deborah Carmichael and James R. Knecht, Associate Editors, Film & History, and Richard Vela, Contributing Editor, Literature/Film Quarterly. Nine graduate students were recognized and given awards for their presentations, including two new awards, The Charles Redd Center Award for Western Studies, and the Albuquerque Convention and Visitors Bureau Award for Southwestern Culture. Executive Director Phil Heldrich and Secretary/Treasurer Ken Dvorak began their leadership of the SW/TX PCA/ACA by taking the SW/TX group to meet jointly with the national organization in San Antonio, Texas, for their annual meeting. This Texas-sized event was highlighted by several memorable events. First, Sally Sanchez from Houston, Texas, agreed to become our Program Coordinator replacing Leslie Fife whose tireless efforts working for the SW/TX organization were now devoted to the national. During the SW/TX area chair/business meeting, Ken announced the successful negotiation of a three-year contract with the Albuquerque, Hyatt Regency Hotel, moving the SW/TX annual meeting downtown closer to its roots along historic Route 66. Adding to the excitement, Ken announced a new graduate student award, the Albuquerque Convention and Visitors Bureau Award for Southwestern Culture. The renewable gift of $500 is to be given annually to a graduate student whose presentation focuses on Southwestern culture. We met again in a city that seems to have become our home base (and not only because of the wonderful chile). For a second time, the Albuquerque Hilton served as the conference hotel. The Creative Writing Area under the direction of Jerry Bradley and the Motorcycle Culture and Myth Area under the direction of Gary Kieffner were two of the largest areas this year. Friday featured a special presentation – Wushu Theatre: Master Bow Sim Mark and the Use of Traditional Wushu Techniques in Theatre with an introductory paper by Mike Conway, writer, researcher, and member of the Bow Sim Mark Tai Chi Arts Association. Our luncheon speaker was Rudolfo Analya, who spoke of his trip to Washington where he received the National Medal of Arts. He also addressed the necessity of keeping our spirits uplifted through comedy and humor, even in trying times. Many participants in the full ballroom expressed how much Analya’s speech inspired them. Afterwards, he graciously signed books for a long line of admirers. Leslie Fife served as Conference Scheduler, and Susan Rollins, mentor to the new leadership of Philip Heldrich and Ken Dvorak, served as Conference Host Supervisor. And of special note: Peter C. Rollins and Michael K. Schoenecke officially passed on the core responsibilities to Philip Heldrich and Ken Dvorak. Rollins, in the wake of a heart attack, had by this time converted to a ”Mr. Moderation“ approach to professional meetings, while Schoenecke had been promoted to the job of Secretary/Treasurer of the National PCA/ACA. For quite different reasons, it was most appropriate for both to step back from organizational responsibilities. The organization met again in New Mexico, a central and enjoyed location for many participants, but this time at the Albuquerque Hilton. Michael K. Schoenecke served as the substitute Program Chair and Host, as well as contributed his work as complaint chair. Brad Duren aided with audiovisual and Philip Heldrich, Leslie Fife, and Amanda Cobb (with her students) took care of the registration table (and fielded complaints for Schoenecke). Susan Rollins worked behind the scenes to be sure everything went well. Tony Hillerman was our luncheon speaker, who entertained a full ballroom. He spoke largely about the development of his famous literary detective, the Navajo policeman, Jim Chee, and the number books set on the Navajo lands of northeastern Arizona and northwestern New Mexico. Hillerman also discussed his admiration and respect for the Navajo culture. The meeting returned to the Sheraton Oldtown and, during this year, rose to nearly 900 registrants. Local teachers participated with student groups and were admitted at no charge. We also partnered with Ron Briley’s institution, again, with benefits to our organization and the students of Sandia Preparatory School. Paul Rich and his Universidad de Las Americas (UDLA) contingent participated and contributed a spectacular reception which served over 600 people with a magnificent spread of hors d’oeuvre in the Tex-Mex style. The luncheon at this meeting was attended by 800 people and was addressed by Alberta Lee, daughter of the nuclear scientist – and accused spy – Wen Ho Lee. Lee spoke from her heart about the agony which she and her family had suffered over the last few years and had pointed remarks about the press and its lack of accurate and professional reporting of her father’s dilemma. Lee’s presentation was covered by two local television stations, Reuters and the Associated Press. Stories appeared on local television and in the papers of both Albuquerque and Santa Fe. The news stories about Alberta Lee’s talk drew further attention to our presence in the City of Albuquerque. It was a real honor to meet this charming, sincere, and committed woman. Again, the Sheraton Oldtown was our meeting place, and the numbers jumped radically into the 700 range for participation. Ron Briley, Assistant Principal of a local school, was an enormous help with audiovisual needs and student volunteers. Returning from ”conference“ retirement, Peter Rollins was the Program Chair while Michael K. Schoenecke did all the work, a fine arrangement. The Creative Writing Sessions were extremely varied and numerous, due to the special efforts of Jerry Bradley. Philip Heldrich began his term as president of the Southwest ACA and presented the Peter C. Rollins Award for the best graduate student paper on a popular culture topics. Topics of novelty included Cultural Geography; Route 66; Law & Culture; Manifest Destiny; Southwest Ranching; Professionalism; and Atomic Culture & the Nuclear Age.